This is from the back of the box of Barilla No-Boil Lasagna Noodles. We just love it! Preheat oven to 375 degrees. Spray baking pan (13 x 9 x 2) with non-stick cooking spray. Remove 16 noodle sheets from box. In medium bowl, beat eggs. Stir in ricotta, 2 cups of mozzarella and the Parmesan. 1. Spread 1 cup of sauce on bottom of baking pan. 2. 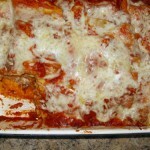 Layer 4 sheets, 1/3 of ricotta mixture, 1/2 of meat, 1 cup of mozzarella, 1 cup sauce. 3. Layer 4 sheets, 1/3 of ricotta mixture, and 1-1/2 cups sauce. 4. 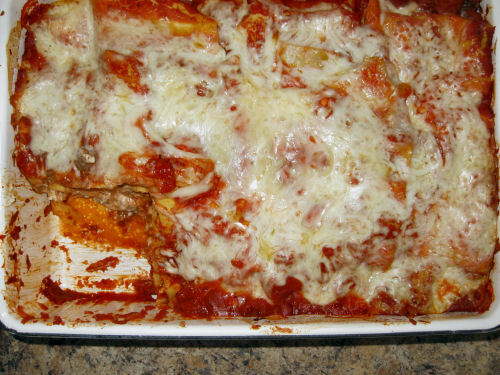 Layer 4 sheets, the remaining ricotta mixture and meat, and 1 cup sauce. 5. 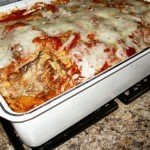 Layer 4 sheets, the remaining sauce, and remaining 1 cup of mozzarella. Bake, covered, with foil and placed on a large rimmed sheet (it may spill over) about 50-60 minutes. Uncover and bake 5 more minutes. Let stand 15 minutes before cutting. 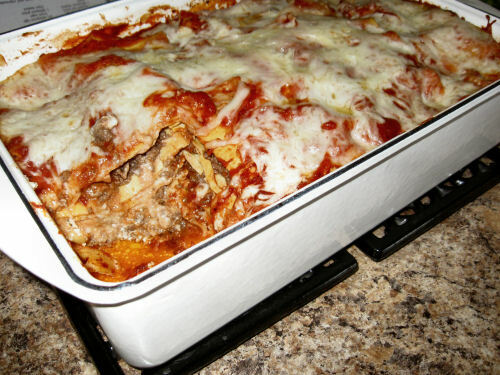 Spray the aluminum foil prior to placing it over the lasagne before going into the oven. It really helps it to not stick.